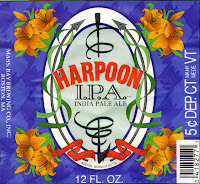 The Beantown Bloggery: Harpoon Summer Session Starts Today! Boy it's nasty out today. And according to forecasts right now, it's going to be rainy tomorrow as well. I've got the solution for you. Drown your sorrows in beer. Starting tonight is the annual two day Summer Session at the Harpoon Brewery. What is The Harpoon Summer Session? Click (here) for more details on where to park, what bands will be playing, and any other information you might be looking for. 0 Response to "Harpoon Summer Session Starts Today!"